Flat head syndrome, or in medical terms “Positional Plagiocephaly” is a common condition that affects many newborns. Usually, the condition corrects itself but in some cases, an expensive, uncomfortable helmet needs to be worn for a number of months. 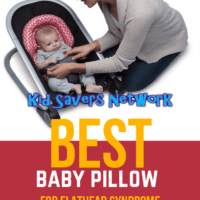 To prevent baby flat head syndrome, many parents turn to a specialist baby sleep position pillow. Here are the most popular ones on the market in 2019. Can A Pillow Really Fix Flat Head Syndrome? What Is The Best Baby Pillow For It? What Size Mimos Pillow For My Baby? What Age Can Use It? “Flat head Syndrome” refers to flat spots on one side of the back of the skull. It’s very common, and a recent study performed by Calgary’s Mount Royal University found it affects almost 50% of newborns aged 7 -12 weeks old. The good news is, positional plagiocephaly usually corrects itself as our babies grow and develop. It is also believed to have absolutely no adverse impact on our baby’s brain development. Following the Government’s “Back to Sleep” campaign to prevent SIDS, also known as Sudden Infant Death Syndrome, many American infants developed flat heads from sleeping on their backs. A newborn‘s heads is very soft and malleable. The pressure of sleeping on a firm mattress in the same spot every night can cause positional flat head. In rare cases, the condition can be hereditary as well. It’s pretty common for vaginal deliveries to cause flat head due to the pressure of the birthing canal. The baby head shape will look normal after 6 weeks so flat spots after this time are worrying. Usually, parents become concerned about flat spots when their newborn is around 2 months old. If the situation hasn’t improved by 6 months a lot of pediatricians will recommend a flat head helmet. Flat head syndrome is something that is said to fix itself. However, many parents turn to a baby pillow to give nature a hand. These pillows are said to help shape the skull and relieve pressure on the head and neck muscle. If you read the hundreds of product reviews online, a lot of parents see results in just a few weeks and are delighted with their baby head shape. Some pediatricians recommend expensive baby head helmets for deformational plagiocephaly. They cost around $3,000 and are seldom covered by medical insurance. They also have to be worn for around 23 hours a day for 3 months! So, it’s understandable that many parents give baby pillows for flat head syndrome a try first. The ones on our list start at around $20, so they’re much less than a helmet. Pillows are also much more comfortable for our babies, too. 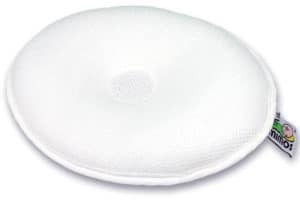 Despite many pediatricians suggesting more tummy time and advising against a pillow in the crib (in case of smothering) there’s quite a market for flat head pillows. Many can also be used for bassinets, bouncers, car seats, “rock and play” and playtime. You can use them for naps but babies should be supervised at all times. The biggest danger (and our greatest fear) is an infant rolling over and suffocating themselves so they’re not recommended for unsupervised baby sleep or naps. But remember, incorporate tummy time for all of its benefits but not for flat head syndrome. Let’s take a look at the most popular flat head pillows on the market today. The Mimos Pillow is the “Premium” flat head pillow on the market. It’s around 3/4 times the price as the Lazy Lambert and Baby Moon. But is it 4 times as good for preventing flat head? Let’s take a look at the features and design. The design and material quality of this pillow put it in a class above its competitors. It’s 100% breathable meaning it’s a lot safer for infants to use. The Mimos pillow has actually been awarded a TUV certification for safe air flow and anti-suffocation. You can smother yourself with the pillow and still be able to breathe through the pillow’s material. This is what many parents do after receiving the pillow, so you can instantly put your fears to rest. 94% of the pillow’s volume is air which makes it easier for infants to breathe. All the material is made from expensive 3D spacer fabric so it’s also very soft and gentle for a baby’s skin. 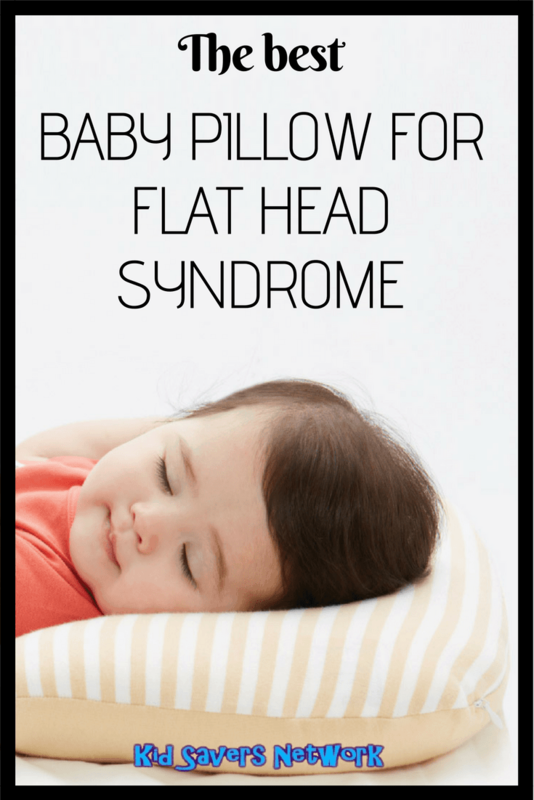 The main cause of Flat Head Syndrome is a baby’s head repeatedly laying on the same spot on a hard mattress. The Mimos pillow provides 400% more surface pressure than a regular mattress spreading out the pressure from one spot on the cranium to a much wider area. This makes the pillow incredibly effective at plagiocephaly prevention. The Mimos pillow allows 180 degrees free head and neck movement. This means your little one’s neck muscles will develop symmetrically and helps prevent the risk of both flat head syndrome and torticollis (a stiff neck that remains in the same position). Yes! While the pillow seems expensive for well…. “just a pillow”, consider it as one of those baby safety items such as a carseat, crib, exersaucer, or other item. The Mimos Pillow was designed by doctors, physiotherapists, and neurosurgeons to reduce the pressure under the head. The ingenious design allows the head to grow normally to its natural shape. A flat head pillow is a mainly a preventative device. The best results are experienced when it is used from the very first day of life. And especially before the baby hits 6 months of age. One of the main things that sets the mimos pillows apart is they are not “One Size fits all”. There’s a variety of sizes to suit your newborn’s size, activities, and development. Mimos Pillow XS (formerly knows as Mimos L). Most babies can be sized for a Mimos pillow based on age. For those that want a little more certainty, a seamstress tape measure is a good approximation. And if you really want to be precise, you can buy the Mimos Craniometer. The Mimos Baby Pillow is anti-allergic, ant-static and dust mite and fungi resistant. The pillow machine washes and dries throughout in no time at all. You have to pay extra for the pillow cover which is annoying. However, the cover makes the pillow feel smoother and softer. It also keeps things hygienic and you won’t need to wash the pillow itself as much. Safety: The Mimos pillow is 100% breathable with 94% of the pillow made up of air. It is made with a very special foam that is 100% Oeketex certified spacer fabric. Cooling: There is often concern the pillow could become hot like a typical memory foam pillow. That is not the case with this wonderful pillow. It does a great job at preventing moisture and heat build-up with excellent airflow. Hygiene: The Mimos pillow is anti-static, anti-allergenic, and resistant to fungus and mites. If you compare the Mimos Baby pillow to its competitor’s then it’s hard to make a case for it being worth more than $100. However, when you consider that a flat head helmet is around $3,000 – $4,000 it doesn’t seem so expensive. Can you wash Mimos pillow? The Mimos pillow is machine washable. Follow the directions on the label. How to use Mimos pillow? The Mimos pillow is nearly round, with one skinny end. That skinny end goes underneath the baby’s neck. And it’s recommended to always put the baby on it’s back. There are several other pillow options below at different price points to consider. Or you can speak with your pediatrician about the baby sleep position method where parents periodically counter-rotate and reposition their babies head. We think this is the best pillow on the market for flat head syndrome, a good night sleep, and give it our 100% endorsement. Ultimately, only you can make the value judgment, and you can find the online price here for Mimos S (XL) or Mimos M (XXL). Special designed weight distribution baby pillow. TUV Certification - 3D breathable Air-spacer fabric. Use in crib, pram, push chair, stroller or bouncer. Machine washable, Chemical and Dust-mite free. The Babymoon Pod is the infant pillow many parents recommend for plagiocephaly flat head syndrome. It can be used in all the places you’d want it to be – strollers, bouncers, cribs and car seats are all o.k. It’s also great for when your little one is playing on their back. It provides great neck support when used with a car seat so you do get a number of different uses from the pillow. Many parents have reported using the BabyMoon pillow at around 2 months old to around 6 months old with great results. At 2 months, the Babymoon pillow is not too bulky and is comfortable for the baby. The BabyMoon also has a special opening allowing the baby to lay down easily and not be in contact with a firm surface. The fabric of the baby flat head pillow is very soft and comfortable, too. To prevent sudden infant death syndrome (SIDS), doctors recommend that babies sleep on their backs. But that has led to more baby flat head issue’s. A great plagiocephaly pillow can help prevent flat head syndrome and also prevent a stiff neck, also called torticollis. What I really like about this pillow is that it’s made in the USA and it’s very easy to machine wash. The Babymoon’s low price also makes it cheaper than many other comparable designs. Product Dimensions: 25 x 25 x 7.6 cm; Sizing is adjustable. The ClevaMama Foam Baby pillow is the only pillow scientifically proven to reduce the pressure on the back of your baby’s head by 50% and increase support by 80%, to help prevent deformational Plagiocephaly, also known as Flat Head Syndrome. It has great results allowing the babies natural shape of the head to develop naturally. All the material is Oeko-Tex 100 certified for use with babies. 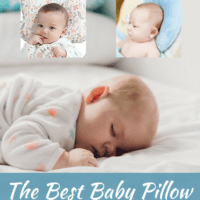 Manufactured using fabrics and foams that are hypo-allergenic, PH balanced and toxin free makes the baby flat head pillow suitable for use with babies who suffer from asthma and allergies. The AirFlow™ fabric draws away moisture and increases airflow. The pillow’s material is incredibly soft and gentle. A lot of parents have praised it for being very well made, the perfect size, and the best investment in baby gear they have made. It’s suitable for babies aged 0 – 12 months old. The pillow comes with a cover that is both removable and machine-washable. Extremely helpful for those babies that drool in their sleep. A great idea one reader mentioned was buying the pillow and a ClevaMama replacement pillow cover at the same time. They come in both pink and blue. That way you always have a clean one handy. Many mom’s find buying 2 pillows super convenient, leaving one in the crib and letting the other one be “portable” for use in the living room or away at grandma’s house. Let baby get a good night sleep anywhere! The pillow itself can be washed gently by hand using a mild detergent. Squeeze excess water from the pillow and allow to dry flat. For the price, the ClevaMama Foam Baby Pillow is surely one of the best baby flat head pillows for the money. It’s not a pillow per se, but the Boppy Noggin Nest has been used by many parents to help prevent and treat plagiocephaly Flat-Head Syndrome. The Noggin Nest can be used from about 3 weeks old up to 6 months and is ideal for bassinets, baby bouncers, car seats, baby swings and under baby gyms. As with most flat head pillows, it’s not recommended for crib time. The Boppy Noggin Nest has a specially designed cut-out that elevates and cradles a babies head whilst providing a lot of support. This alleviates the pressure that a firm baby mattress places on a developing babies head. The Noggin Nest has a lot of side padding so it’s supportive and comfortable for your baby. The side padding helps keep the babies head stay centered and protected, too. Many parents have been using the Noggin Nest with their car seats. They have found that it provides more support than the very small pillows that come included with most car seats. There are also two slits with velcro tabs that can attach to car seat straps. This ensures the baby’s head is safe and secure and will not bounce around. The Noggin Nest is one of the top-rated baby pillows on the market today. Its low price allows you to give it a try without too much worry. The WelLifes Baby Pillow is a very cute infant pillow which can be used from newborn to around 6 -months. The pillow uses a weight distribution function to help prevent flat-head syndrome. While WelLifes doesn’t claim it can fix a baby that already has a flat head, parents have reported it has helped and sometimes fixed their childs flat spot. This organic cotton pillow was designed to be used for floors and in cribs. It must be mentioned (again!) that it is not recommended to use it unattended. That is you should use it during the daytime when you can keep an eye on your little one. The cover of this infant pillow is made out of 100% organic cotton. The filling is made from hypoallergenic polyester in consideration for an infant’s sensitive skin. There are no bleaches or dyes. They also have extremely high quality. They are handmade showcasing meticulous stitching and finishing. This is not a low-quality, mass-produced pillow. WelLifes doesn’t specifically state the age range for this pillow, it’s commonly been reported that up to 1 years seems to be an average age. WelLifes says that this product can be machine washed, but they advise hand washing is better. The WelLifes baby pillow acquired the organic international certification known as GOTS (Global Textile Standard). They’ve also earned OE100 certification (Organic Exchange Standard) organic farming certification. The use only certified organic cotton fabric, grown using sustainable farming practices that maintain and replenish soil fertility without the use of toxic and persistent pesticides and fertilizers. Click here to find out the latest price on Amazon. The information on this website is informative and comes from our own experience as parents, from manufacturers websites, discussions with other parents, and other mediums. This information should never replace the advice of a certified medical doctor. Talk to your pediatrician or see a child neurosurgeon if you think your child may have plagiocephaly, brachycephaly, or some other cranial deformity. SUPER SOFT organic cotton fabric textile cover developed by our own technology will surely complete a downy and snug bedding for your baby in all seasons thanks to its unique soft and warm touch and raising effect. This baby pillow is very hygienic as it has very smooth surface so that dust or baby hair doesnt stick to the surface. Acquired the organic international certification such as GOTS (Global Textile Standard) and OE100 (Organic Exchange Standard) organic farming certification. Use only certified organic cotton fabric, grown using sustainable farming practices that maintain and replenish soil fertility without the use of toxic and fertilizers. Cute baby pillow with concave center for flat head prevention. 100% Hypoallergenic polyester filling. 100% RISK-FREE GUARANTEE - We want to ensure you are getting the best value possible. We are committed to your satisfaction. We hope you are happy with your purchase. When you click the Add to cart button, you have our promise that youll be satisfied or well send you a prompt refund. No questions asked!